Can someone please tell me how the heck to pronounce that. Because honestly, I can’t even read Chilaquiles. I try to sound it out and man, it just does not work. Like at all. I sound like a total idiot and or someone who just got out of surgery and is all jacked up on pain meds. And trust me, I know what someone on a whole lot of pain meds sounds like. I think we are the family of broken bones and surgery. My younger brother Kai takes the crown for the most painful surgeries. Hip replacement at thirteen anyone? Broken femur at seven? Collar bone…..twice. Yeah, he’s had a rough number of years. Oh then there is Brendan. Brendan was playing on the railing of our stairwell with my two oldest brothers when he was, well actually I wrote nine or ten here at first, but then my mom said he was three (well almost four)! Then she thought about it and said, “maybe you better leave it as nine or ten”. The kid is a monkey and my parents did everything they could to keep the kid from constantly climbing, jumping, swinging and exploring. They put him in gymnastics, gave him a trampoline, a bike, ice skates, even a jungle gym and the kid still wanted to climb unsafe things. Things like trees, and houses (now he flies over jumps made of snow) and um, the stairwell. Well one time, the stairwell did him in. He slipped and fell fifteen feet on his face and basically shattered his whole face. I know! It is crazy, but it was pretty bad. Not sure what else he broke, but he was one lucky kid and all good in a couple of months, but his nose will never be completely straight again. Oh and I feel I should tell you that I have not once broken a single bone. I am such an outsider in my family. Seriously, if I did not have my dad’s nose (trust me, it is his) I would have a blood test taken. Oh and I also feel I should tell you that I am in a huge food rut. All I want to make is fruit salsa, eggs and basically nothing else. My brain is fried. Fried. Oh and yeah, I should probably tell you a little about these Chilaquiles. Basically they’re best breakfast, lunch or dinner. They are so quick, so easy and so good. I mean tortilla chips are involved. That is just always awesome, but then there are mangos and black beans and corn. Oh yeah and the fried egg and the Queso fresco (obsessed!). Plus, I love the soggy baked chips on the bottom and then the crunchy baked chips on top with with the warm cheese? It’s a flavor AND texture winner for sure. Basically they're best breakfast, lunch or dinner. They are so quick, so easy and so good. I mean tortilla chips are involved. That is just always awesome, but then there are mangos and black beans and corn. Place oil in a heavy bottom skillet and place over medium-high heat. Sauté onion and garlic for 2 to 3 minutes. Reduce heat to medium and continue to sauté for 2 minutes. Add the corn, mango chunks and jalapeño and sauté another 8 to 5 minutes or until the corn is caramelized and soft. Stir in green chiles and continue to sauté for 2 minutes. Add black beans, adobo and broth and stir together. 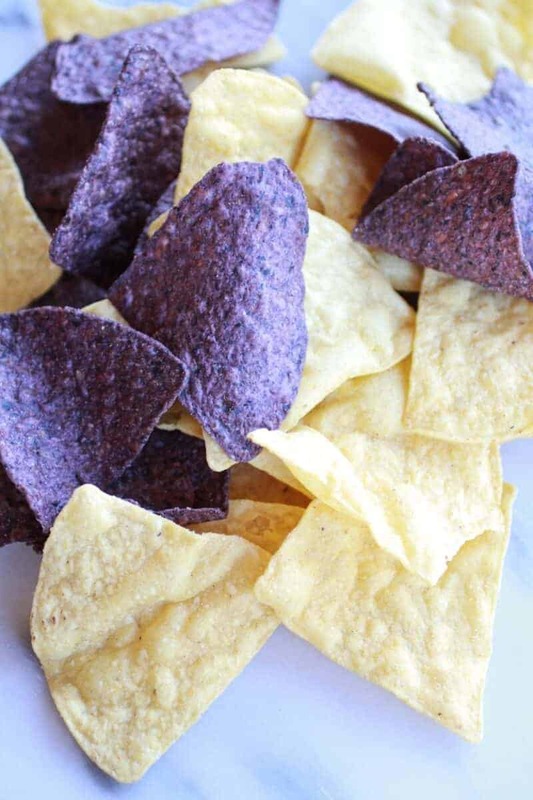 Bring mixture to a boil and begin adding tortilla chips, a handful at a time, folding gently to coat every chip. Allow chips to soak up some liquid before adding more. Repeat until most of the chips have been added, save a few for topping. Season with salt and pepper and gently fold together. Remove from the heat. Crumble on the remaining tortilla chips and a little queso fresco. Bake for 12 to 15 minutes or until all liquid has been absorbed. While the chilaquiles bake, fry the eggs. 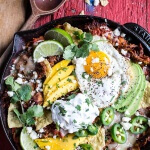 Remove the chilaquiles from the oven and top with queso fresco, avocado, fresh cilantro and then the fried egg. Eat! CHEE lay KEE lays Is a pretty good way to think of how to pronounce Chilaquiles. Thank you! That totally helps!! I say being the outsider when it comes to broken bones is a good thing! 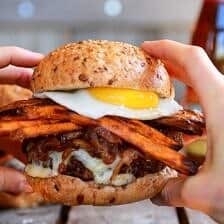 Love anything with a fried egg on top! Oohhh how delicious!! This looks amazing! Loving the colours in the post. So beautiful! 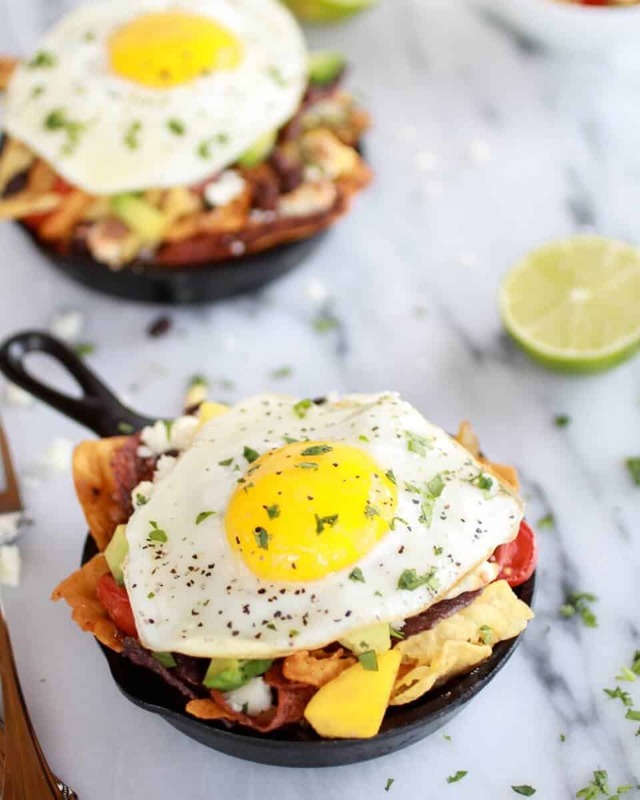 These Chilaquiles look so appealing specially topped with the egg! 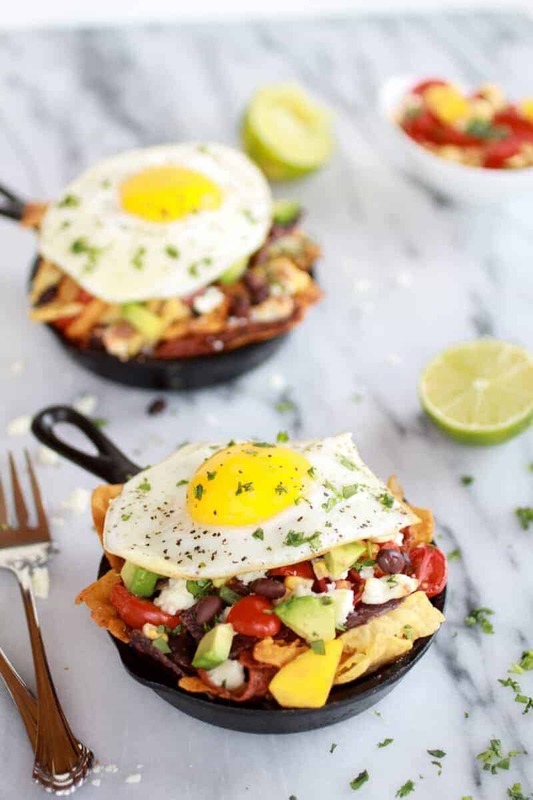 Whats not to like about egg, avocado, black beans and adobo sauce! Yum! Heres hoping there are no more broken bones in your family! 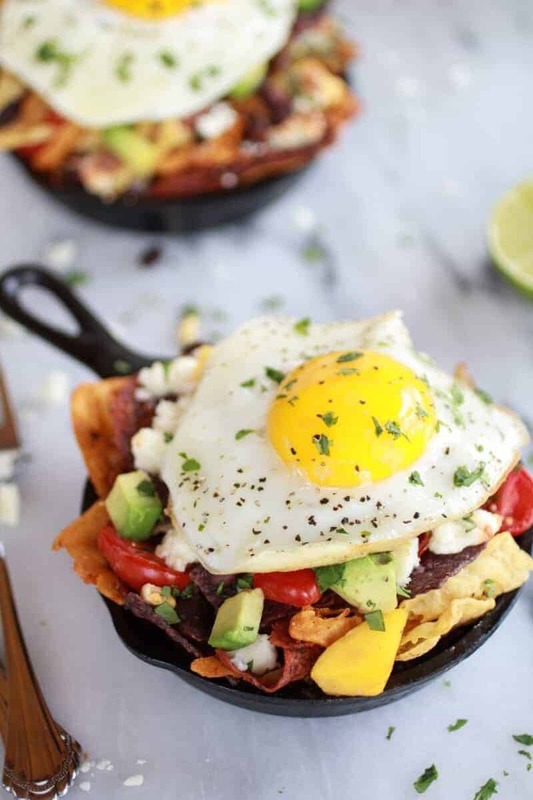 I’ve never broken a bone either 🙂 And, however you pronounce it, these chilaquiles look AMAZING! INCREDIBLE!!! 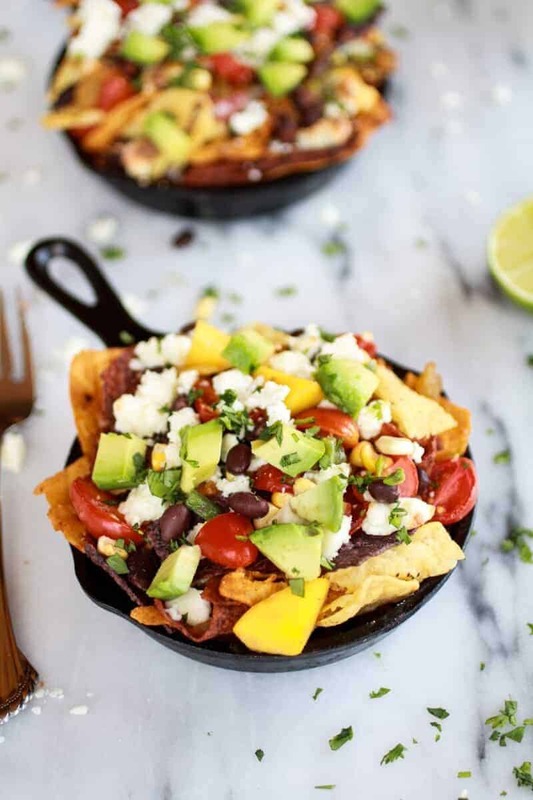 They almost look like individual nacho servings! Thank you so much, Steph!! 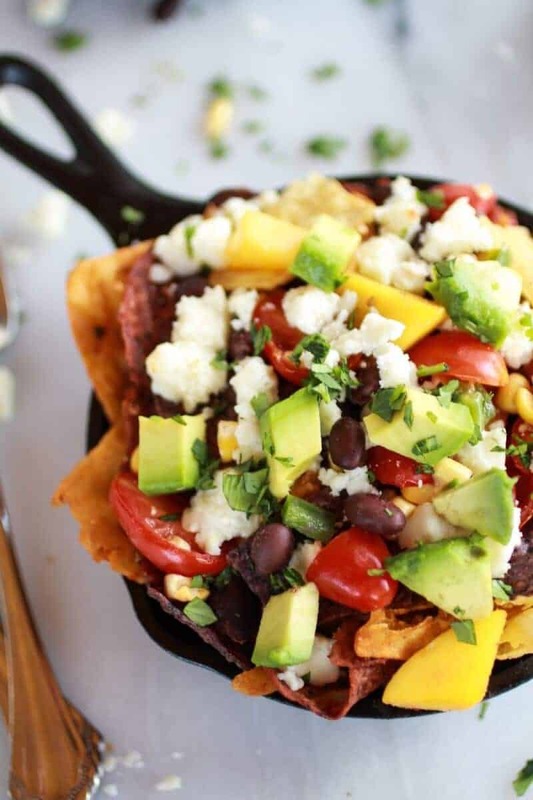 Breakfast nachos is what I am calling them! 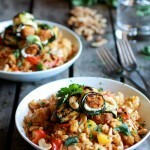 This looks like the perfect summer dish, fresh flavors with minimal cook time – yumm! Beautiful photos too! They may be simple to assemble, but girly, there’s a whoooole lot going on with these delicious bad boys! Mouth’s a-waterin’! This has my name written all over it. I adore anything with Mexican flavors! Thank so much, Lauren! I love mexican flavors too! 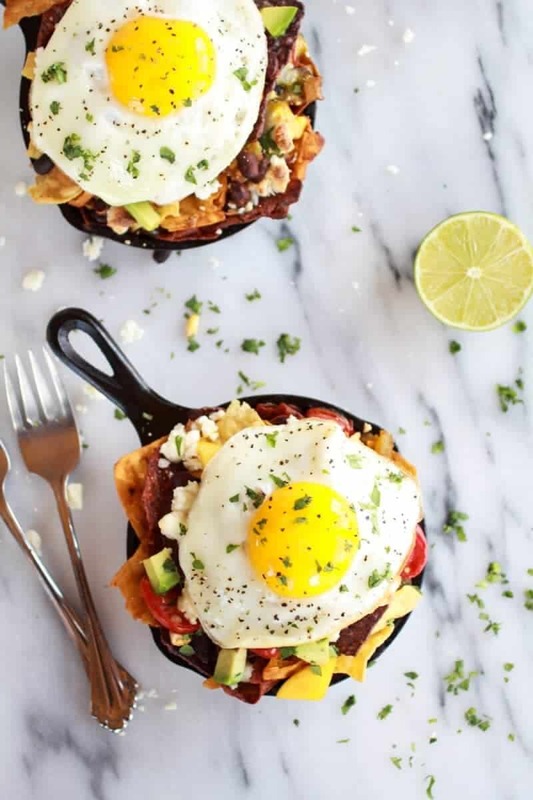 I used to waitress at a place that served these (Chee luh Key luhs is how I say it) and I would always describe them to people as “breakfast nachos” so good. 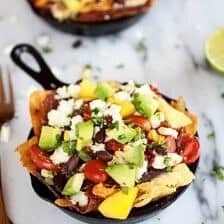 Yes, breakfast nachos are what these are!! Except I totally ate them for dinner! Ha! 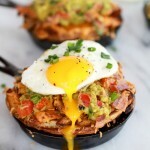 Chilaquiles are favorite, these pictures have me craving some! My brother is known for breaking bones but I haven’t gotten a single injury yet! 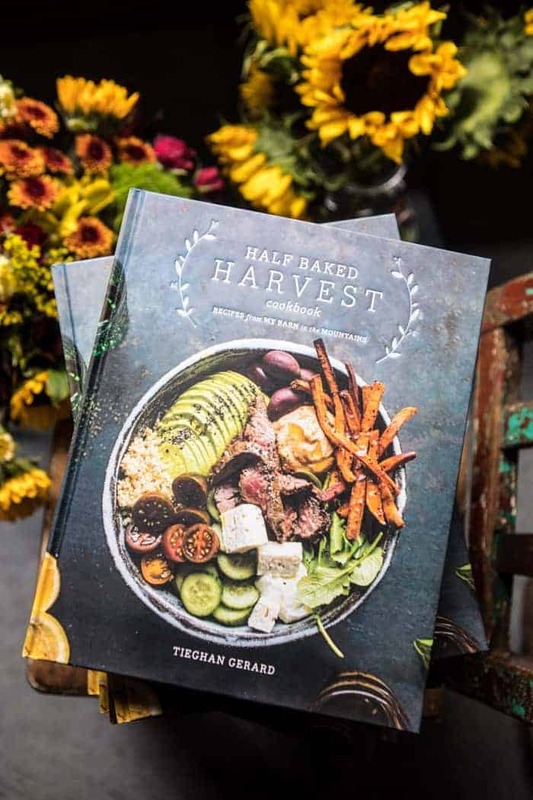 This dish sounds fabulous! Thank you so much, Nicole!! Sounds like our brothers need to take it easy! Anything that combines avocado and dippy eggs is totally right up my alley! I know, me too! Thanks Hannah! This is just so gorgeous!! The flavors are over the top amazing!! I always think that a colourful dish is a good healthy one. Love this idea and the cute little pans! I agree! Thanks you, Trisha! I have no idea how to pronounce these either but I do no that I want them. Bad. Ya, I am not alone! 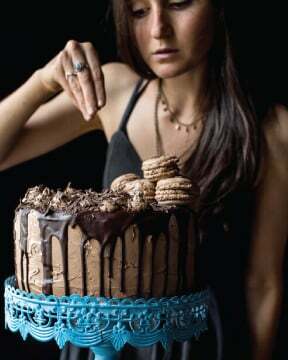 You always blow me away with your deliciousness!!! 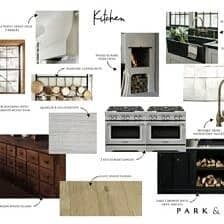 😉 These look fantastic!! These are pronouced Chee-la-key-less. This is an interesting take on them and can’t wait to try! 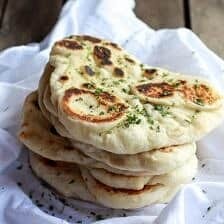 My mother made these for us growing up, and it was the first meal she made for my hubby when we first started dating. Its now his favorite meal that she makes. However she makes them in a more traditional way, she cuts corn tortillas into triangles, shallow fries them in a large skillet with a little sliced onion and when they start to get crispy she throws in her special sauce mixes and then covers it with cheese and puts a lid on until the cheese is melted. Oh so good! Oh my gosh, Melissa! Wow, those sound amazing. 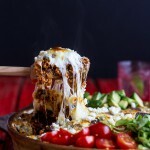 Were can I get this recipe!? You think your mom will share that special sauce? HAHA! Thanks so much, Heather!! I love eggs! I was so excited to try these, and I realize corn is in the name, but it’s not in the ingredients list. I’m assuming just a can of corn? Ziplist didn’t pick that up so neither did I. These will have to wait another day 🙂 Thanks! Oh no! So sorry, karen! Yes, you can use whatever corn you would like you just simply leave it out. No big deal! Thanks and I hope you love these! I don’t actually see corn listed in the ingredient list. 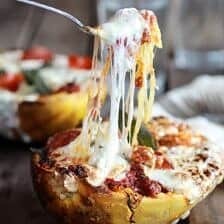 I love all your recipes! Made this tonight. Your ingredients call for tomatoes and 1/2 lime, but the instructions do not include them. When do I add the tomatoes and lime? I added at the end, with the toppings. So happy you loved these!! And you added them at just the right time!! I wil fix the recipe, THANKS!